It isn’t much, but it’s beautiful, and it’s my home. Growing up in rural Pennsylvania, I spent my childhood wandering through the countryside. The woods and mountains were my playground, the rivers and creeks my pools. My childhood memories were built in a land that seemed to possess a certain enduring purity, a ceaseless beauty. Then I grew up. And I learned that the mountains where I spent my youth had the potential to serve a purpose beyond fueling the imagination of a little girl—they were able to fuel something much more destructive. 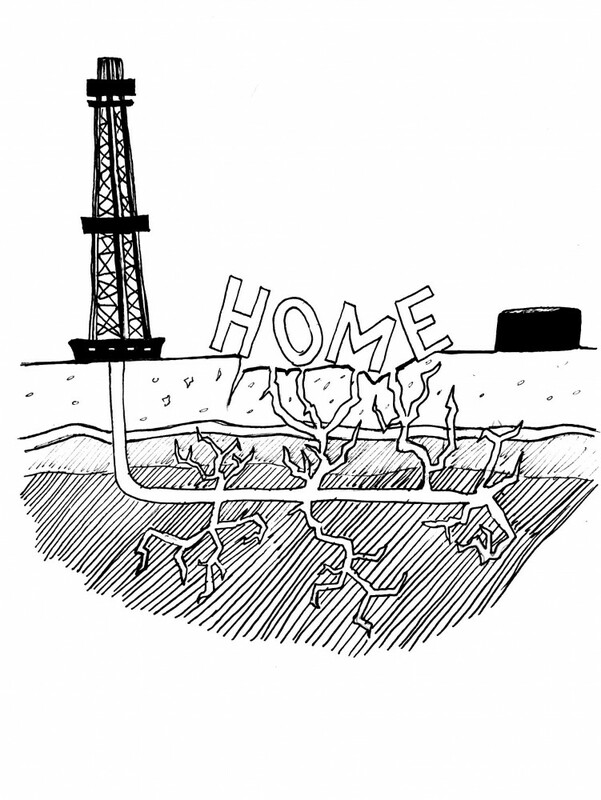 My home lies on one of the largest deposits of Marcellus Shale in the United States. And as I grew up, the fracking industry moved in. As profit seeking, highly unregulated private companies flooded my home to indiscriminately extract natural gas from the foundation of my childhood, the trails and mountain paths that once welcomed me with open arms were replaced by caution tape and locked gates. Natural gas is a misnomer. Hydraulic fracturing is a process of drilling during which vast quantities of water, sand and over 40,000 gallons of 600 different chemicals are pumped thousands of feet into the earth to fracture ancient beds of shale, releasing gas from the rock. There’s nothing natural about it. This has not only put a strain on already dwindling water sources, but has also resulted in the pollution of our air, the contamination of our water, and general devastation of the landscape. Driven by myopic profit maximization and a misguided belief that they are acquiring a reliable source of fuel, these companies have bought out politicians, communities and individuals so they can continue to play by their own rules and profit from the lives and lands of people who are unable to protect themselves. When they began to extract shale near my home, the rules of the game changed. It was the first time I was exposed to the destruction and corruption of this extractive industry. My community was shrouded in ignorance and taken captive by an industry that offered pittances in exchange for pollution and environmental degradation. I didn’t know where to turn to express the anger and confusion that I felt in the presence of blatant injustice. Now, I am sitting in because the institution that I have chosen to dedicate four years of my life to, to which I have given my money and entrusted my education, is invested in the very industries that are destroying my home and polluting the landscapes of my childhood. I am sitting in because it is the only thing I can do at Bowdoin to stand up for my community back home, and against the industries that threaten it. Bowdoin profits from practices that not only counteract my personal beliefs, but also go against the promise that it made to us—to “count nature a familiar acquaintance” and to work towards the common good. The investment of Bowdoin’s endowment in the fossil fuel industry signifies a tacit compliance with these industries’ morally ambiguous practices that disproportionately affect poverty stricken populations who do not have the resources to prepare for the impending ramifications of climate change. Practices that not only have foreign, distant consequences, but that have ramifications in our very own backyards. Practices that are decidedly contrary to the common good. With 70 faculty members and almost 1,000 students supporting us, we presented our case to the Board of Trustees in October. Now we are taking action. Alongside over 80 students who have signed the pledge to take a stand for climate justice, I’m sitting in because, as Bowdoin students, it is our duty to stand up—and sit down—for what we believe in. It is our time to be the leaders that Bowdoin has encouraged us to be, that Bowdoin should be proud of. We have petitioned, presented and done our part. Every institutional route to the Trustees has been closed to us, and we have been left with few other options. Joseph McKeen, the first president of our college, said that “Literary institutions are founded and endowed for the Common Good.” It is hypocritical for Bowdoin to continue to profit from the fossil fuel industry’s indiscretions. I am here because it is time for the Trustees to engage in an honest and transparent dialogue with their students. I am here because the Board of Trustees, the faculty, and the students, together, need to conduct a thorough investigation of what financially responsible divestment from fossil fuels would look like at Bowdoin. I am here for my home. And I will be here until my voice is heard. Neutrality is no longer an option. Trustees, it is time to decide. Whose side are you on? Jamie Ptacek is a member of the Class of 2017. Last Thursday, William Nelson Cromwell Professor of Constitutional and International Law and Government Richard Ernest Morgan ’59 died of metastatic lung cancer at the age of 77. A distinguished professor who taught at his alma mater for 45 years, Morgan was buried yesterday in Pine Grove Cemetery—where many former faculty members, including Joshua Lawrence Chamberlain and several College presidents, are also buried. According to fellow Bowdoin faculty members, constitutional scholars from around the country and four decades worth of students, Morgan was a caring and dedicated scholar with a range of passions outside the classroom that added to his impressive life. A Teacher at HeartMany liberal arts colleges do not have a permanent constitutional scholar on campus, and the most famous professors in the field are almost all faculty at prominent law schools—not undergraduate institutions. Morgan was well published, writing numerous scholarly texts and hundreds of essays and articles about constitutional law for various journals and think tanks throughout his career. For professors like Uhlmann, Morgan was a trendsetter in the study of the Supreme Court, despite the relative anonymity that came with working at a small college in Maine. Professor James Stoner, a constitutional law professor at Louisiana State University who Morgan befriended in the mid 1990s, echoed Uhlmann’s sentiments about Morgan’s role in their field. Morgan was as appreciated by his students as he was by his colleagues. Many of his students, like Mitch Zulkie ’91, who studied law after Bowdoin and now works for the law firm Orrick, Herrington & Sutcliffe, alluded to Morgan’s unique ability to question their assumptions in a scholarly and thought-provoking manner. Another of Morgan's former students, Ed Lee ’74, went on to become the Mayor of San Francisco, Calif. in 2011. Students also greatly valued his narrative approach to constitutional law—a subject that has the reputation of being dense, repetitive and dry. Morgan’s reputation as an outstanding constitutional law professor earned him deep respect and admiration from his colleagues. Morgan was also well known at Bowdoin for being one of the few conservatives on a predominantly liberal-minded campus—something he was always aware of in class and in the community. One of his long-time colleagues in the government department, Professor of Government Paul Franco, remarked that one of the qualities he admired most in Morgan was his ability to balance his own political leanings with a scholarly approach to his studies. An Old-School GentlemanMany of the people who knew Morgan best stressed his unique position on campus, both literally and figuratively. Roosting in his office atop Hubbard Hall, he dressed like the picture of an esteemed college professor, had a well-known love for fine scotch whiskey and exercised a dry wit that so many around him treasured. Morgan also led an active life in the Maine woods. An avid hunter, canoer, fly fisherman and bird watcher, he was never stopped from pursuing his love for the great outdoors. Morgan was also known for steering clear of technology like email. Lynne Atkinson ’81, government department coordinator, had the unofficial position of Morgan’s online voice—helping students get in touch with him and pointing them up the spiral staircase to his office. Many described Morgan’s deep love for the College, which he carried with him for all 49 years he spent on this campus. He had been declining in health for the past few years and had begun preparing two final courses to teach before his retirement at the end of the 2015-2016 academic year. After being diagnosed with cancer, Morgan visited one of his former students, President Barry Mills ’72, to discuss his future plans. Morgan brought his constitutional law textbooks to his consultations in Boston, Mass., preparing his lectures as if nothing was wrong. And in his last days, which he spent in a hospital bed, his love for Bowdoin still shone bright. —Sam Miller and Kate Witteman contributed to this report. Editor's Note: The article was updated to include a statement from the Mayor of San Francisco, Ed Lee '74.